Horling’s Garden Centre is located just outside of Lakefield on Lakefield Highway (formerly Hwy #28). They have been in business in the same location for 40+ years! I remember going there as a kid when it was a butcher shop! At the time they also sold a few plants, but the business is totally transformed now. They offer quality plants as well as full landscaping services. They have a large selection of trees and shrubs including many native plants. The Hydrangeas were blooming when we were there in late July! 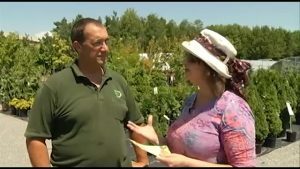 I visited with Ian Nichols, the greenhouse manager. We talked about Garden Route and their involvement in this cooperative group of garden-related businesses in the Peterborough area. In addition, Ian highlighted a new stonework service they are offering. It was a hot day! I hope you’ll tune in to watch us sweat! Watch this episode of Garden Gate as we visit with Ian.